It’s gone now; it stood at the rear of the Junior School in Rectory Road Grays, approached via a long gravel drive, and built on a sloping site, a former gravel pit. The whole School was timber framed and clad, hardly a brick in sight. The main building housed the kitchens, nurse’s treatment room, showers, the cloakrooms, the Head Mistress’s study, and the assembly hall. The hall had floor to ceiling windows that folded back, thereby living up to its title of Open Air School, as did the two class rooms, these were linked to the hall by covered walk ways. Two asphalt playgrounds, upper and lower, each with outside lavatories, lots of grass, and all surrounded by tall trees. I joined in 1940, and in a world about to go mad, this would be my haven of peace here I would be safe. This change of school separated me from my brothers; as it was over a mile away, as the crow flies, and gave mum the burden of taking me, and collecting me at the end of the day. After all I was only five, and a ‘little B’. So I was walking over ten miles a week, and Mum was doing twenty. Bus rides were out of the question, for both of us it would have cost half-a-crown a week, (12.5p). However Miss William’s the headmistress, eased the burden, and instructed Mr. Wakefield the School Caretaker to open the bottom gate each morning, and evening, thereby cutting Mum’s walk by five miles a week. Later I was trusted to travel by bus, and the walk to the bus stop down Rectory Road took us past a sweet shop run by two sisters. There you could get a glass of fruit drinks, for one-penny, and in the winter, could get it warm for an extra halfpenny. Tuberculosis, Rheumatic Fever, Poliomyelitis, Bronchitis, and Rickets had been around for many years, as the world waited for Alexander Fleming to discover Penicillin. Meanwhile Open Air Schools were set up to care for the child victims of these scourges, and to give them as good an education as their counterparts in local schools. In some respects it was better, for the classes were small, and the teachers could, and did give you the individual attention that was so badly needed, particularly as some had spent time in sanatoriums, and needed the individual attention that only this type of school could give, to enable them to catch up with the rest. The Open Air School was a different world, on arrival each morning, we would change our boots, or shoes for rubber soled slippers, yes we did have morning assembly with hymns and prayers, but we got a warm drink and some thing to eat before hand. After dinner, a meal which was all fresh cooked on site, we went to the washroom, were we cleaned our teeth, the toothpaste being doled out by nurse Hayes. Then we went for an afternoon nap on canvas trestle beds, in the summer this was held on the field under the shade of the poplar trees, with Nurse Hayes keeping watch for enemy aircraft. The school day ended with a final assembly, with more hymns and prayers. Miss Williams coached, the upper class, in hymn singing. She said it was important that we should learn new hymns, and sing them well, so that the younger children would learn through them that there was a power greater than any on earth who would see us through come what may. We sang ‘O’ God our help in ages past’ and ‘For those in peril on the sea’ and ‘Now thank we all our God’ and many others which in later life would become old favourites. These singing lessons, would later lead me to joining my brother’s in Chadwell-St-Mary’s Parish Church choir, had we got religion? No it was just a ‘nice little earner’ sixpence on Sunday, three pence rehearsals, and a whole shilling for weddings. It was Miss Williams who encouraged me in reading, she would read to our class from classics like ‘Rob Roy’ ‘Master of Ballantray’ ‘kidnapped’ ‘Treasure Island’ ‘A tale of two Cities’ and many more. One of the highlights of our school life was, Doctor’s Day held twice a year. Those selected for examination would change into PT kit, and be weighed and measured by Nurse Hayes, and then taken into be seen by Dr Brown. He would sound your chest, and ask you to put out your tongue, sometimes your mother would be in attendance. Those deemed in need of building up, would be prescribed ‘Parrish’s Food’ an iron tonic that turned your lips mauve. One thing he could never cure was my chilblains, a ailment caused by the cold damp winters , these sores broke out on your fingers and toes, they itched like mad, but if you scratched them they would bleed. Miss Williams had a friend in Canada, a Mrs Gray, who sent us a sack of rice under a Commonwealth ‘Send-A-Parcel’ scheme. And to further supplement our diet, the school had it’s own market garden, which we boy’s tended under the supervision of Mr Wakefield the school caretaker. I remenber Ernie Parish, Roy Raven, the White sisters, Angela, and Dorothy, Mary Quinn, Daphanie Ashwell, Teresa Easton to name but a few. 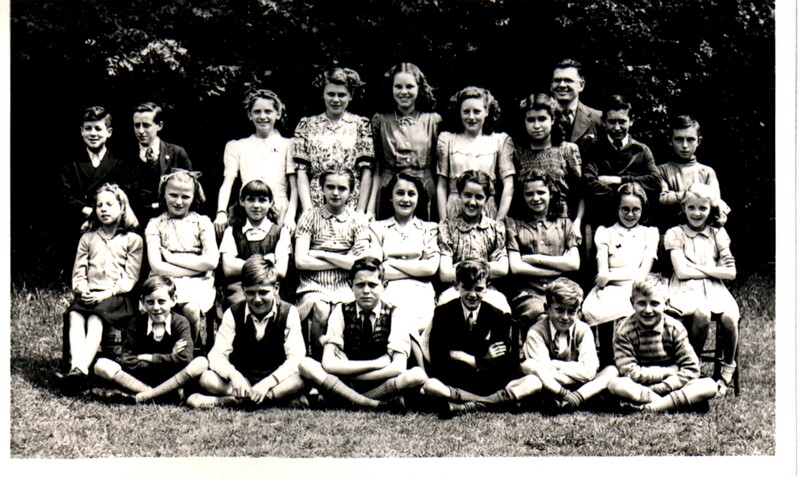 My mum June Stroud is seated in the middle row. Fifth in from the left or the right. She went to this school because she had pneumonia a number of times during the war caused by staying in the air raid shelters. Apparently it was quiet damp in them. Her father, (my grandfather) Frank Stroud said after mum was sick so much they were not going to go down the air raid shelters anymore. Instead they hid under the stairs during the air raids. Lovely to see this photo of my mum who turns 83 in 2018. We now live in Australia. Great to see this article forwarded to me by Marjory Malt, who was the first person I met when I started at the Open Air School about 1944/45. She was the star who showed me what to do on my first day by leading me to the ‘blanket cupboard to get a blanket and pillow for the sleep period. I still have a picture of me and Henry Snelling (behind the stumps), posing at playing cricket. Mrs Love was our teacher in the lower classroom. She read us stories of Brer Rabbit and from many other children’s books. I thought she was wonderful and the best first teacher any child could have. Yes Nurse Hayes was there too dishing out the dreaded spoonful of malt each morning! I think a Mr and Mrs Morgan were the head master and head mistress when I was there. Other names I recall were; Brian Bacon, Trevor Clark, Henry Snelling and of course Marjory … whose maiden name eludes me at the moment. Like you Ted, I had a similar journey to travel from Thurloe Walk off Hathaway Road Grays, walking if it was fine, and by bus when I first started at OAS. I think I left in 1948 when I was sent to Quarry Hill School in Grays, but thats another story. By coincidence I am up to chapter 2 of my biography which is about my birth and early childhood. I would be pleased to hear from anyone who may have been there when I was at OAS. I found this site from a speculative Google search this Bank Holiday weekend, while my Dad – Ernie, as mentioned above – was staying with us. He picked himself out as the lad second from the left in the back row. 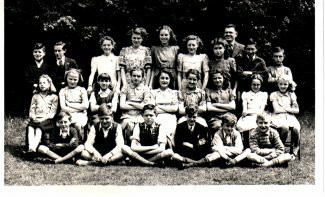 He also remembers several of the children in the picture, but is certain that it was taken no later than 1948, the year he left, rather than 1949. Dad would be interested to know what happened to the others in the picture, so if anyone has any information of this kind, please could they respond to this comment. I remember that shop and the two sisters in Rectory Road so well, I went to the Rectory Rd Infants & Junior Schools. The drinks were fizzy, made in a huge machine (or so it looked to us). Even in the war, they still managed to get the gas for it.